The Graphic Communications Program prepares the students with entry-level skills for the graphic industry. Learning takes place through hands-on experiences with the real “world of work” practices. Student’s training includes working with clients/customers who desire various kinds of graphic requests. Their training includes such clients/customers as The Mayor’s office, Leominster’s Fire and Police departements, and various community organizations. During the first year in Graphic Communications, the student goes through Freshmen Tech Awareness and are then chosen by the instructor if the student demonstrates interest in this field. 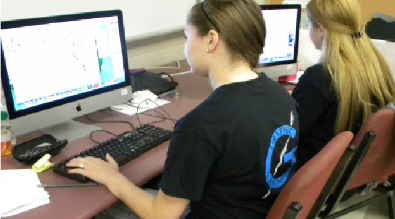 The student then finishes their freshmen year by learning the basics of the graphics programs. During the 2nd year in Graphic Communications, desktop publishing is introduced with software that creates layouts and designs. Students are introduced to Photoshop and InDesign graphics software, image assembly, offset press, automated bindery operations, direct image and bixhub C600. Our applications include the following shop areas: Graphic layout and design including typography utilizing the iMac O/Sx computers with the Adobe CS5 software such as; InDesign, Illustrator and Photoshop programs. The various presswork methods will be performed on digital technology and Offset printing will be printed upon a 2-color Heidelberg QM-46 Printmaster press. As technology is constantly changing, we now advanced our training to fiery controlled RIP presswork on a Konica Minolta /BizHub C6000 Direct Imaging Press. 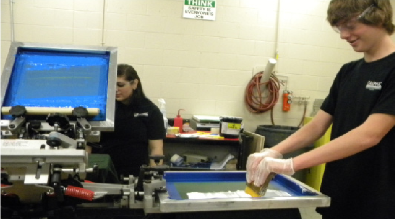 We do screen-printing in our program and train with many outstanding T-shirt designs. Recently, we have introduced Pad and Cylindtrical printing which anables students to print on hundreds of different promotional products. We also do wide format printing such as posters, banners, signs, bumper stickers etc. A Graphtec CE 1000-60 vinyl cutter is our newest piece equipment which is used for a variety of graphics applications such as signs, banners, print and cut decals, apparel decoration, and other two-dimensional / 3D projects. Lastly, in the printing stages, we have to include our bindery and finishing training. The students are trained in various bench top binding methods like spiral and comb binding, lamination, paper drilling, and stapling. Advancing onward to an automated perfect binder, automated paper cutter. Lastly, we must include the training of the electronic fiery programing of the finishing unit of our Konica Minolta direct imaging press. As the students move forwards to the senior year, they will be tested on all the program’s shop equipment at the end of the last term for their vocational certificate of competency.